A week in, I’ve made lots of progress in lab, have failed to make any progress with IT and HR, and have a to-do list that is literally several pages long. And yes, I am falling in headlong, which surprises nobody. However! I have decided that, since this is my last summer of not technically having any responsibilities besides those I give myself, and since I am already showing up to work 3 months early to get a head start, Fridays are my day “off” to catch up on other things I want to do. Except I can’t find my camera. I have a bunch of pictures on there that I wanted to show you, and it is just nowhere to be found. I really wish that the house was together enough for house pictures, but there are still a few niggling things that need to be done before it’s done, and right now it looks like a house lived in by two people who work a lot and don’t really feel like hanging pictures in their evening time. (Which it is. At least it’s an honest kind of mess.) All the major things are done, but that last inch is taking longer than the mile, you know? So. House photos soon, but not today. I was going to show you pictures of our one walk down into Salem, where we peeked in at my new LYS, but that’s on the camera that’s on walkabout. 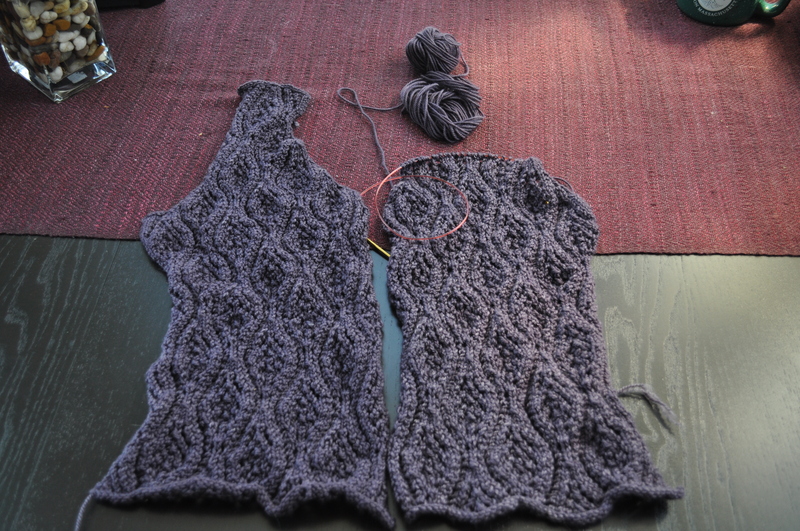 I am well into the neck decreases, and should be done with the shoulder strap in another hour or so of knitting. I need to get the pattern written for the front section today so that I can start the back panel and test all my decrease charts. I am hoping for knitting time, though I understand that there are lots of “family activities” planned, so we’ll see what happens. I have gotten some spinning done in the evenings lately. 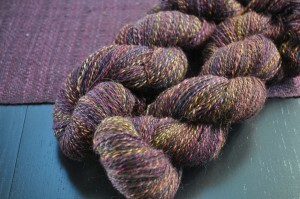 Last night, I finished plying up the Fiber Optic singles with the brown Rambouillet that I dyed to go along with them. I really like the way this came out. Using just two plies preserved the long color repeats of the silk, and the brown lends a nice background color to the yarn. 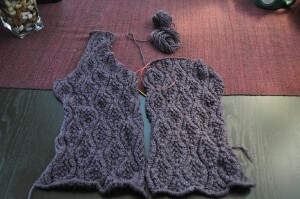 I’m not usually a fan of barberpole/marled yarns in the skein, but I almost always love them knit up. When I look at the skein in my hand, the barberpoling seems really pronounced and the brown is almost too dominant, but if you step back a bit the silk pops right out again. I spun the brown and the BFL/silk to the same gauge, but the Rambouillet is significantly fluffier than the BFL silk and so doesn’t take as much fiber to make the same thickness of yarn. After plying the two together, I have 6 oz of yarn, which means that there is 2 oz of brown left on the bobbin. I find it amazing that I seem to have gotten twice the length out of the Rambouillet, but it is pretty fluffy stuff. I’ll ply the rest of the brown on itself, and that should give me another 2 oz of matching yarn to play with. All told, I ended up with 453 yards in 6 ounces, which puts me pretty firmly in the laceweight category. It still need to be washed to set the twist, but it’s pretty fine right now. And with that, I am off to begin pattern writing, packing, and otherwise getting my house in order. Hopefully I’ll be back with more pictures soon! I’m not at all surprised that you’re diving right in – and I well know the look of the two-page to-do list! I also know all about that last inch; somehow once things become livable, it’s easy to move on to other, more emergent, things to do and the little things just hang on. Those skeins of yarn are just stunning through – I love the colors! Wow, you seem to be settling in quickly. I don’t envy your commute, although it’s nice that you can take the train/subway. I interviewed for a job with a 55-minute-when-there’s-no-traffic commute, and was almost relieved not to get it just because of the amount of driving involved! Good luck with the packing and have a good trip to Florida! Wow!! You really are busy. Was this house so amazing that you chose the extra long commute or there was nothing closer in? 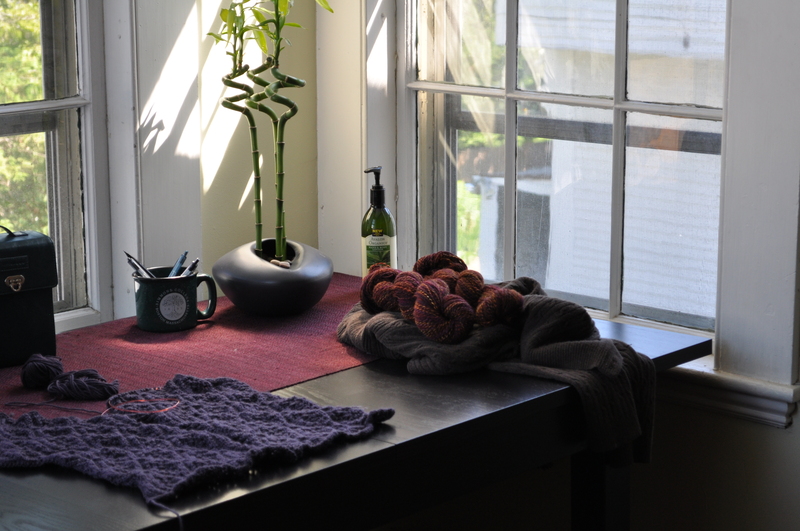 The yarn is beautiful and I look forward to seeing the finished sweater. 93 degrees here today, Erica!! Any form of commute that can be worded as exercise should be! I understand that difficulties of bus knitting and it being busy, which I assume is similar to train knitting. Seems like you definitely going to be very busy! I sighed about your commute until I saw that much was by train. The time there doing some knitting and daydreaming will be a great source of ideas – for both fiber and your research. DesigKnit is powered by	WordPress 4.8.9 . Page generated in 0.297 seconds using 35 queries.